General James' impressive staying win at Geelong on Tuesday made it the third victory in 12 days for trainer Danny O'Brien with progeny of New Zealand stallion Savabeel. The Waikato Stud sire has made a massive impact on the racing industry and he continues to go from strength to strength, and O'Brien is a big fan. "I love this breed of horse. They are tough, strong and just get better with age," O'Brien said. "General James' win today was excellent as he did at both ends of the race and he was still stronger than any of his rivals on the line, which bodes well for his next few races." Ridden by Craig Newitt, General James was made to work early as he went forward from the widest gate and then a mid-race move pushed him back to third in running. Newitt was at the gelding from the 800m, but he kept responding to the vigorous riding and cleared out to score by 1.75 lengths. The win, which was the four-year-old gelding's fourth from 19 starts and took his prizemoney past $80,000, was a heat of the Synthetic Stayer's Series. "I would expect that he will contest another heat at Pakenham on July 17 over 2200m and then proceed to the final a fortnight after that all going well," O'Brien said. 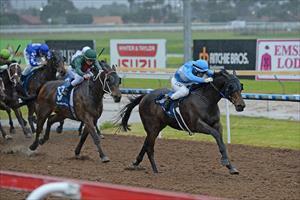 This series culminates with a $50,000 BM78 Final over 2200m on the last day of the racing season (July 31) at Pakenham. The run of wins for Savabeel progeny by the Flemington trainer was started by Savatone at Bendigo on June 23 and was continued by Syrahbeel at Geelong last week. Savatone will contest the Silver Bowl Series Final over 1600m at Flemington on Saturday, while Syrahbeel will be out to pick up the third win of her campaign at Pakenham on Thursday.